Donald Trump’s most recent foreign policy speech, in which he explained how he would deal with the Islamic State (ISIL) and the Middle East in general, contained multitudes – everything good and everything questionable about his brand of ‘America First’ nationalism. Here is Trumpism on full display, the common-sensical and the nonsensical intertwined. While I realize a presidential election campaign is not the time for nuance, it behooves us to pull apart these disparate strands if we want to understand this moment in our history. He starts out by defining the problem: the series of attacks that have horrified the world and flummoxed our law enforcement agencies. And what’s notable here is that he just doesn’t talk about what’s going on overseas, as you might expect in a speech ostensibly about foreign policy: he talks about San Bernardino and Orlando alongside Paris and Brussels. In short, he brings it all home. This underscores his entire orientation: it’s what ‘America First’ is all about. Why should Americans care about ISIL? Well, folks, says Trump, it’s because they’re attacking us right here on the home front. Contrast this with the usual neocon-Hillaryite politically correct gobbledygook: we have to spread Democracy and Goodness throughout the Middle East! They don’t have gay rights in Afghanistan! We must defend the ‘international order’! This post was published at David Stockmans Contra Corner by Justin Raimondo ‘ August 17, 2016. Playing a coveted role in the most one-sided assault in the history of political journalism, NBC News ran an article last week that managed – in the headline – to insult both the candidate and his base, ‘Trump’s Conspiracy Theories Aren’t Far Outside GOP Mainstream’. Today, if a politically troublesome issue arises, the media feel no pressure to investigate. Confident their peers will slack off as well, they tend to dismiss the issue as a ‘conspiracy theory’ and deride those who raise it as gullible, paranoid, and probably racist. Donald Trump has raised any number of such issues, and the media have reflexively attacked him for raising them. His focus has been on Barack Obama’s quasi-fictional past. A more profitable focus, however, would be on Hillary Clinton’s future fitness to be president. I refer specifically here to her role in the corruption of the TWA 800 investigation. When my book, TWA 800: The Crash, the Cover-Up, The Conspiracy, was published last month, I hoped the twentieth anniversary of the disaster might prompt at least some media interest. I was kidding myself. The collective urge to stop Trump and elect Hillary has silenced the major media. Trump will have to ask his own questions. This post was published at Lew Rockwell on American Thinker / August 17, 2016. US health insurer Aetna already made waves earlier this week when it announced on Monday that it would exit 11 of 15 state exchanges in which it offers Obamacare plans as a result of mushrooming financial losses. While that move was largely expected due to the inherent flaws in Obamacare, today it surprised market watchers, and its shareholders, again by handing an ultimatum to the Department of Justice, and thus the US government, threatening it would immediately reduce its presence in the remaining Affordable Care Act exchanges and cancel a planned expansion, if its merger with Humana was blocked. Amusingly, the analysis of the announcement broke down firmly along party line: according to some, the previous decision to exit more than two-thirds of Obamacare exchanges was the first shot across the DOJ’s bow, coming a few weeks after the Department of Justice filed a suit to stop the Humana merger. Prominent Republicans, including Donald Trump’s campaign, said the move, which came after similar ones by other major insurers, reflected flaws of the ACA. Others, notably those with a more Democratic bent, including Elizabeth Warren, suggested that Aetna’s stance on the exchanges was affected by the Justice Department’s decision. ‘The health of the American people should not be used as bargaining chips to force the government to bend to one giant company’s will,’ she wrote in a Facebook post. This post was published at Zero Hedge on Aug 17, 2016. …… In the improbable candidacy of Donald Trump, the Republican Party got what it deserved. After all, its job in the context of American political democracy is to function as the nation’s fiscal guardian. Yet that role hardly fits the GOP’s new presidential nominee and erstwhile constructor of hotels and casinos, who now promises to build the greatest ever walls, roads, bridges, military and other accoutrements of national greatness. But then again, the GOP has been derelict on the fiscal front for most of the last for 35 years . Instead, it has become a gang of neocons, social cons, tax cons and just cons. Perhaps Trump is merely the ultimate expression of the latter. The first two of these contemporary GOP factions – the neocons and the social cons – aggrandize the size and role of the state. This extends from the uninvited policing of the worlds’ neighborhoods and nations to the unjust intrusion into domestic family, religious and social life. The ‘tax cons’ correctly recognize that private enterprise, not the state, generates prosperity and wealth and that tax barriers and disincentives to production, investment and work should be lowered whenever possible. But they fail to heed the great Dwight D. Eisenhower’s fundamental rule for fiscal governance now that the cat of Big Government is out of the bag. This post was published at David Stockmans Contra Corner on August 15, 2016. When one thinks of the neoconservatives what comes to mind is their warmongering, and they have indeed been the War Party’s brains since their incubation inside the Democratic party and their defection to the GOPduring the Vietnam era. Yet there are other aspects of the neooconservative mind – or, rather, the neoconservative personality – that are significant, and one of these is their viciousness. These guys (and gals) fight dirty: the smear, the ad hominem argument, is their signature method. Remember the campaign against Chuck Hagel that targeted him as an ‘anti-Semite’ They lost that one, yet they are not the type to change their ways. They tried the same tack with Donald Trump, throwing every smear in the book at him, and their reaction to his amazing victory in the primaries underscores both the primal hatred they feel for their enemies, and their obsession with control of the institutions they infiltrate. For many months now, Bill Kristol, the neocons’ little Lenin, has been trying to gin up a fifth party candidate who will take enough votes away from Trump to deny him the White House. First there was Mitt Romney, and then was Sen. Ben Saase being floated as the chosen sacrificial lamb, and whenthey demurred the Kristolians turned to one David French, a scribbler forNational Review – who backed out after a week. But now, finally, the #NeverTrump movement – which was always a neocon front group – has come forth with a willing candidate: Evan McMullin, a 40-something year-old former CIA agent, former House Republican foreign policy director, and former investment banker at Goldman Sachs. This post was published at David Stockmans Contra Corner by Justin Raimondo ‘ August 15, 2016. I am in the throes of finishing a book on the upheaval represented by the Trump candidacy and movement. It is an exploration of how 30 years of Bubble Finance policies at the Fed, feckless interventions abroad and mushrooming Big government and debt at home have brought America to its current ruinous condition. In order to complete the manuscript on a timely basis, I will not be doing daily posts for the next week or two. Instead, I will post excerpts from the book that crystalize its key themes and which also relate to the on-going gong show in the presidential campaigns and in the financial and economic arenas. Another of these is included below. This post was published at David Stockmans Contra Corner by David Stockman ‘ August 12, 2016. According to the mainstream media, this should be a “no-brainer.” Trump’s economic plan would mean depression, fire, and brimstone with massive job losses and, in general, all the worst parts of the bible for America. However, Hillary Clinton’s plan will ‘fix’ everything – more jobs, lower taxes (apart from for those nasty middle-class Americans), better economic growth, and ponies and unicorns for everyone (except the wealthy, they can buy their own unicorn). The farce of campaign promises is getting almost too much to bear as we wonder, if Hillary has all these brilliant ideas, then why did she not share them with President Obama – who just presided over the only term without a 3% growth year in the history of America. As The Wall Street Journal reports, Hillary Clinton will dial up a line of attack on Donald Trump’s economic proposals in a Thursday speech that casts his agenda as a crony giveaway that erodes his populist appeal, according to a campaign official familiar with the remarks. The Democratic nominee’s remarks will brand Mr. Trump’s proposal to sharply reduce taxes on so-called pass-through entities, where business income is claimed on individual tax returns, as the ‘Trump loophole.’ Mr. Trump would lower the top personal tax rate to 33%, from 39.6%, but to benefit small businesses Mr. Trump has proposed taxing pass-through income at 15%. This post was published at Zero Hedge on Aug 11, 2016. Fake Money, Fake Capital OUZILLY, France – Little change in the markets on Monday. We are in the middle of vacation season. Who wants to think too much about the stock market? Not us! Yesterday, Republican presidential candidate Donald Trump promised to reform the U. S. tax system. This should actually even appeal to supporters of Bernie Sanders: the lowest income groups will be completely exempt from income and capital gains taxes under Trump’s plan. We expect to hear crickets from the socialists though. Oh, and below you will see why Trump only got $19,000 from hedge funds, while Hillary ‘we came, we saw, he died’ Clinton got $48.5 million (crickets from assorted socialists so far). But who cares, Trump is Hitler, right? His proposals are nothing new – simplification, fewer brackets, eliminate loopholes for rich people. But he also targeted the ‘carried interest’ exemption. ‘Carried interest’ – or ‘carry’ – is a term used in the financial industry to refer to what is essentially a performance bonus. The exemption allows Wall Street money managers to count earnings as capital gains. This helps them keep more money in their pockets (capital gains are taxed at a rate of 23.8%. Labor income is taxed at a rate of 39.6%). This post was published at Acting-Man on August 11, 2016. …… Unfortunately, it is too late to reverse the tidal wave of system failure that has been brewing for three decades now. It will soon end in a speculator implosion. Whether that crisis commences before November 8th or soon thereafter is largely immaterial. If the Trump campaign has the good sense to focus on the gathering economic storm clouds, it’s the one thing that could catalyze an out-with-the-bums uprising across Flyover America on Election Day. So let us reiterate our thesis even more vehemently. The idea that the American economy has recovered and is returning to an era of healthy prosperity is risible establishment propaganda. It’s the present day equivalent of the Big Lie. It’s the reason why Hillary Clinton’s campaign to validate and extend the current malefic Wall Street/Washington regime is so reprehensible. In fact, the natural post-recession rebound of the nation’s capitalist economy has already exhausted itself after 84 months of tepid advance. Now, the massive headwinds of towering public and private debts, faltering corporate investment and productivity, Washington-based regulatory and tax-barriers and the end of an unsustainable central bank fueled global credit, trade and investment boom are ushering in a prolonged era of global deflation and domestic recession. This post was published at David Stockmans Contra Corner on August 8, 2016. The recent “reported turmoil” with Trump’s campaign is one of the most laughter-inducing things I’ve seen the media “report” over the last several years, along with one of the most-corrupt. Let’s deal with the corrupt first. The “dust-up” began with Trump going after Khan after, I remind you, he spent his entire speech at the DNC attacking Trump. When you get up on a national stage and inject yourself into the political process you are fair game and so is everyone you bring with you. This is especially true when you are lying through your teeth and have a dubious history — including recent history. Specifically, Khan is an attorney who has previously written in a law journal on the “purity” of the Quran and Sunnah. There it is, folks. Oh sure, CNN has said that he “doesn’t” support Sharia law, but his own words say otherwise. If every legal obligation arises from the Queeran, then no obligation in conflict with it is lawful in his mind. This is in direct conflict with our secular government; The Constitution, not Sharia, is the supreme law of the land — and attempting to change that by any means other than amendment (good luck) is an act being taken by an enemy of the nation. This post was published at Market-Ticker on 2016-08-07. One of the biggest surprises over the past week was Donald Trump’s dramatic meltdown, and subsequent escalation, with the family of Humayun Khan, the US Muslim captain killed in Afghanistan in 2014, who during the DNC, tangentially accused Trump and his potential policies of being responsible for their son’s death (he wasn’t). What is most striking is that instead of ignoring this attempt to bait the Republican candidate in public, to which he most gladly obliged, he should have simply moved on and stayed on the offensive, pressing Hillary over the recent Wikileaks disclosure revealing the cronyism and corruption within the Democratic Party, as well push the familiar narrative of her email scandal. Conveniently, Hillary helped him do just that yesterday, when she acknowledged on Friday afternoon that she may have “short-circuited” when she claimed in recent interviews that FBI Director James Comey said she was “truthful” about her use of a private email server as secretary of state. In doing so Hillary once again shifted the news spotlight away from Trump and back on to herself, as she once again revealed that the only consistent thing about Hillary Clinton are the constant lies. Following a heavily covered interview with Fox News’ Chris Wallace, Hillary stated that Comey had found her statements “truthful” and “consistent” with what she has said publicly. Clinton’s lying led The Atlantic to publish an article titled ‘ Why Can’t Hillary Clinton Stop Lying?’ and the Washington Post’s fact checker Glenn Kessler awarded her four ‘Pinocchios’, adding that ‘Clinton is cherry-picking statements by Comey to preserve her narrative about the unusual setup of a private email server. This allows her to skate past the more disturbing findings of the FBI investigation.’ Notably, the NYTimes did not publish anything related to this flop and it took the Public Editor, whose job it to be the readers’ advocate at The NYT, to write an op-ed titled The Clinton Story You Didn’t Read Here. This post was published at Zero Hedge by Tyler Durden Aug 6, 2016. ……. Needless to say, the lack of good jobs lies at the bottom of the wealth and income drought on main street, and the recent BLS jobs reports provide still another reminder. During the last seven months goods-producing jobs have been shrinking again, even as the next recession knocks on the door. These manufacturing, construction and energy/mining jobs are the highest paying in the US economy and average about $56,000 per year in cash wages. Yet it appears that the 30-year pattern shown in the graph below – – lower lows and lower highs with each business cycle – -is playing out once again. So even as the broadest measure of the stock market – -the Wilshire 5000 – – stands at 11X its 1989 level, there are actually 20% fewer goods producing jobs in the US than there were way back then. This post was published at David Stockmans Contra Corner on August 4, 2016. There is a good reason why Donald Trump’s campaign has been light on policy details. To wit, it seems that every time he gets specific he manages to serve up a steaming pile of hogwash. So when he told Fox News that he would double-down on Hillary’s $275 billion infrastructure boondoggle, The Donald was right on cue. And in pulling his new $500 billion infrastructure program straight out from under his comb-over, he also demonstrated he has no idea what he is talking about. No, Donald, the bridges of America are not falling down and the nation’s infrastructure – -to the extent that it is any business of Imperial Washington at all – -is not ‘crumbling’. Actually, Washington’s primary job is maintenance of the Interstate Highway System, and that’s in pretty good shape, including its heavily trafficked bridges. This post was published at David Stockmans Contra Corner on August 3, 2016. Contrary to the spurious ‘morning in America’ refrains of the Democratic convention, the nation is heading for ruin but not due to violent crimes or terrorist threats on main street; it’s owing to the larcenous economic policy crimes of the Imperial City which Trump’s GOP convention narrative hardly mentioned. There is a growing likelihood, therefore, that the Trump campaign will be entirely sidetracked from the core economic crisis of Flyover America. That’s especially owing to The Donald’s shrill remonstrations about the dangers of domestic terrorist attacks. By contrast, after 15 years it is abundantly evident that the horrific attack of 9/11 was a complete fluke. It could have been readily thwarted by alert intelligence work, and even then it only happened because of the complicity of Saudi Arabian officials. In fact, the San Diego based Saudi handlers of two of the 19 terrorists received wire transfers of more than $75,000 from the Saudi ambassador’s wife. We now know from the recently released 28 pages of classified text from the Joint Inquiry that at least one of the handlers – – Omar al-Bayoumi – – was a Saudi agent. The report leaves little doubt that the Prince Bandar faction of the Saudi ruling family facilitated the murderous crime against 3,000 innocent Americans. This post was published at David Stockmans Contra Corner on August 2, 2016. With Democrats howling that Vladimir Putin hacked into and leaked those 19,000 DNC emails to help Trump, the Donald had a brainstorm: Maybe the Russians can retrieve Hillary Clinton’s lost emails. Not funny, and close to ‘treasonous,’ came the shocked cry. Trump then told The New York Times that a Russian incursion into Estonia need not trigger a U. S. military response. Even more shocking. By suggesting the U. S. might not honor its NATO commitment, under Article 5, to fight Russia for Estonia, our foreign policy elites declaimed, Trump has undermined the security architecture that has kept the peace for 65 years. More interesting, however, was the reaction of Middle America. Or, to be more exact, the nonreaction. Americans seem neither shocked nor horrified. What does this suggest? Behind the war guarantees America has issued to scores of nations in Europe, the Mideast and Asia since 1949, the bedrock of public support that existed during the Cold War has crumbled. We got a hint of this in 2013. Barack Obama, claiming his ‘red line’ against any use of poison gas in Syria had been crossed, found he had no public backing for air and missile strikes on the Assad regime. The country rose up as one and told him to forget it. He did. Donald Trump’s inchoate views on economics are mainly a virtue because he has not been schooled in the follies of bipartisan fiscal and monetary ‘stimulus policy’. Essentially, the Beltway’s statist practitioners of the great bipartisan economic policy consensus are advocates of CINO (capitalism in name only). By contrast, whether the business empire Trump claims to have built is all it’s cracked-up to be (by him) or not, there is a secret sauce to it that the mainstream liberal media fails to grasp. They would find it downright frightening if it did. To wit, Trump’s incessant bragging about his business prowess and accomplishments is not merely or even mainly an unbridled and uncouth expression of egotism and self-absorption. Actually, it is a profession of faith – – a policy statement – – that America’s capitalist economy grows owing to what capitalists like himself do, not because of the ‘policy’ interventions of the Imperial City’s knaves, crooks and scolds. To some considerable degree, ‘making America great’ is about unleashing the nation’s capitalists again. It’s an expression that prosperity is not bestowed by the state but won by the kind of builders, investors, innovators and workers that The Donald fancies to be the essence of Trump Inc. This post was published at David Stockmans Contra Corner on August 1, 2016. In a fair election, my best estimate is that Donald Trump would win in a landslide. But this election will not be fair. In fact, few of them are. For Trump’s part, there is no doubt that he has been this year’s sensation. A newcomer to politics, he has thrown out all the conventional rules, played by his own, and found a captivated country hanging onto his every word. Love him, hate him, or somewhere in between… no one can look away from the spectacle. After a war within the party and the convenient disposal of 16 conventional GOP contenders, Trump is now the official Republican candidate and he is in a strong position. 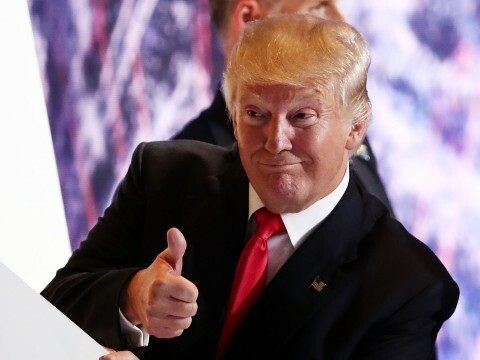 Coming out of the relatively calm Republican National Convention and going into the tumultuous DNC, Trump has enjoyed soaring poll numbers while Hillary has been losing ground fast to the scandals and corruption revealed by Wikileaks and other related mouthpieces. But the fat lady has not sung. This post was published at shtfplan on July 29th, 2016. In the next sections we shall document at length why the US is a nation on the brink of financial ruin. Our purpose at this point, however, is to dispel any illusion that Donald Trump – – the man and his platform – -offers any semblance of a remedy. In the great scheme of history, the Donald’s great purpose may be to simply disrupt and paralyze the status quo. And that much he may accomplish whether he is elected or not. For what is actually happening is meta-political. The bipartisan ruling elites are being Trumped. Their entire regime of casino capitalism, beltway racketeering and imperial hegemony is being unmasked. The unwashed masses are catching on to the ‘rigged’ essence of the system, and have already become alienated enough to rally to outlaw politicians – – like Bernie and Trump – – peddling ersatz socialism and red neck populism, respectively. To be sure, the metaphor of Shock and Awe and the idea of ‘regime change’ have been given a bad name by Bush the Younger and his bloody henchmen. Yet there is no better way to describe Donald Trump’s rise and role than with exactly those terms. This post was published at David Stockmans Contra Corner on July 29, 2016. Because this is the only way Hillary can even make it appear as if she’s ‘winning’ an election: propaganda, vote rigging, cheating, lying, corruption, and fear (in this case, of Donald Trump). If things weren’t rigged, there’s no way she’d even be nominated as convention janitor. This video discusses Sanders winning the first roll call. A Sanders delegate reveals the bombshell at the 6:30 mark, noting Bernie won the roll call as Clinton’s supporters did not come out in large numbers. This post was published at The Daily Sheeple on JULY 28, 2016. Reversing a position that he took just two months ago, Donald Trump told Fox News on Tuesday that he would like to see the federal minimum wage raised to $10 per hour. Trump slammed former Democratic presidential candidate Bernie Sanders for saying, in his Monday speech at the Democratic National Convention, that Trump doesn’t support raising the federal minimum wage. ‘He lied last night, I mean it was a total lie and everybody said it,’ Trump said on ‘The O’Reilly Factor’ in response to Sanders. This post was published at David Stockmans Contra Corner on July 27, 2016.